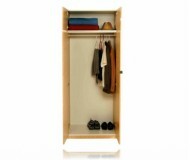 Dimensions:32 1/2W x 21 3/4D x 77 4/25H in. 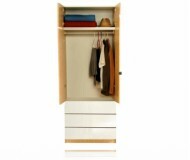 This wardrobe is available in both lacquer and mirror fronts and nine standard case colors to suit your specific needs. 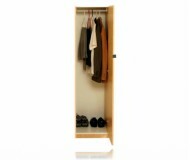 This Basics 556 wardrobe by Sharut Furniture has 2 doors, 2 adjustable shelves for storing your shoes and other bedroom accessories, a hanging rod for hanging shirts and other bulkier items, and a center Interior drawer for non-hanging items. The Bottom can be used as an additional self to store shoes and other accessories. 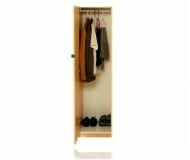 This wardrobe is perfect as an extra closet in the guest bedroom or to store you're out-of-season clothes or formalwear. 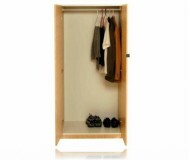 This contemporary closet is durably constructed and works beautifully with any decorating theme. Placing addition individual units side by side for seamless integration, creating virtually unlimited customize interior configurations. This storage area is perfect for your foldable clothes such as pants and T-shirts or also perfect for storing bedroom necessities such as extra pillows and blankets.